The Paunsaugunt mule deer herd is one of the most treasured mule deer herds in the western U.S. They spend their summers in Southern Utah, and migrate across US 89 to the borderlands of Utah and Arizona. 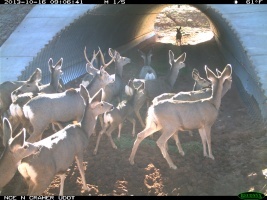 In 2013 UDOT and Utah Division of Wildlife Resources (UDWR) worked together with multiple partners to create 12.5 miles of wildlife exclusion fencing and three new wildlife crossing culverts on US 89 East of Kanab Utah in the Grand Staircase Escalante National Monument. The goal of the project was to funnel the Paunsaugunt mule deer herd through these three new culverts and through three existing culverts and a bridge in their movements north and south, and thus reduce mule deer-vehicle collisions along this stretch of road. The monitoring project will be in place from 2013-2018. Twenty-eight cameras are positioned at the 7 structures and the 4 fence ends, along with a camera at each of two double cattle guards. The study is conducted by Patricia Cramer, research assistant professor at Utah State University.